layer the eggplant between paper towels to dry at least 4 hours but as long as overnight. put the parsley, coriander, garlic, red pepper, and lemon juice in a bowl. add enough olive oil to make a loose dressing. heat a skillet (it does not have to be non-stick) over medium heat. let it get warm before placing slices of the eggplant directly on it. do not add oil, butter or spray. the eggplant will not stick. watch it carefully and cook until it is lightly browned and softened. i tend to pay attention and flip each one 4 or 5 times before it is fully cooked through. cook in batches and arrange the warm pieces on your serving platter. as each layer is placed on your platter...place a bit of dressing on each piece..use the back of a spoon to spread it. do not saturate, you only want a tasting, not a drowning. sprinkle a bit of salt on each layer as you go. once you have cooked and layered all of the eggplant, sprinkle the chevre evenly over the top. 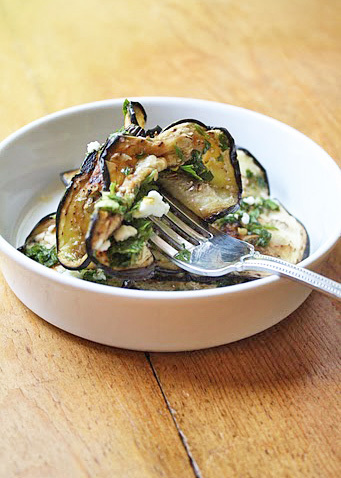 serve immediately, or store in the refrigerator until ready to serve. this can be made a full day in advance. i like to take it out of the refrigerator about a half of an hour before serving. the leftover dressing is wonderful on steaks, chicken and shrimp..or just to dip your bread in. 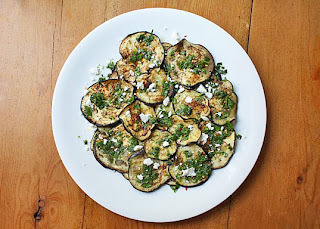 while there is little chance of leftover eggplant, it is wonderful added it to sandwiches and morning omelets.